Now that the Instant Pot is taking over the cooking world, we all want to know: how can we convert recipes to Instant Pot cook time and temperatures? If you don’t know about the Instant Pot, you can find out more here. You can figure out which model Instant Pot would work best for you, as well! 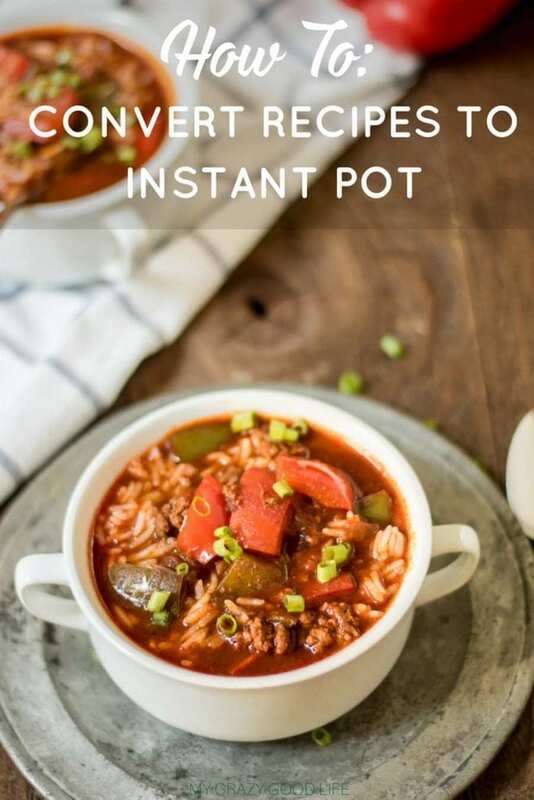 If you’re looking to go backwards from an Instant Pot to a slow cooker, you’ll want to see this post: How to Convert Instant Pot recipes to Crockpot. 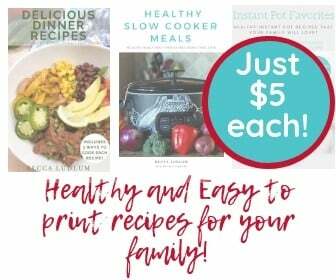 Looking for easy to print Instant Pot recipes? Visit my eBook store! I decided to do a little research to find out the best ways to convert recipes to Instant Pot cooking times and settings. It seems like a sort of hit or miss process but there are some way to make sure your recipes come out right every time! It is never an exact science when trying to convert slow cooker recipes to Instant Pot cooking times and methods, or other recipes either to be honest. Use these tips and tricks to get started; before you know it you’ll be a pro and no recipe will be safe from your conversions! Cooking dairy ingredients in the Instant Pot is a lot different than cooking them on the stove, in the oven, or in a slow cooker. If a recipe calls for dairy ingredients make sure to add them once you have cooked and depressurized your Instant Pot. This is key when trying to convert recipes to Instant Pot cooking. The high heat and pressure and cause dairy and milk ingredients to scorch and that’s an easy way to ruin dinner. When you are working to convert recipes to Instant Pot it’s about more than just cooking time and temperatures. You should be mindful of how full the Instant Pot will get. If you are using anything that expands (think about pasta, rice, beans, etc.) you will need to scale the recipe back to make sure it won’t overfill your Instant Pot. Pressure cookers should never be more than 2/3 full for safety and proper cooking. Full Instant Pot = a pot that won’t come to pressure. I’ve written about the differences between Instant Pot sizes and what this means for cooking. The Instant Pot, unlike slow cookers or the oven, can sauté vegetables and sear meat before cooking. If you are going to convert recipes to Instant Pot cooking times and temperatures be sure to take advantage of the sauté feature to make sure everything is cooking properly and all of the usual flavors come together! Not all recipes are suitable for the Instant Pot or a pressure cooker. When trying to convert recipes to Instant Pot cook times make sure that the recipe is a) suitable for such a cooking environment and b) similar to another Instant Pot recipe! Using a similar recipe that contains similar ingredients will help you calculate a cook time and temperature. For example, when deciding how to cook my Crock Pot Stuffed Pepper Soup in the Instant Pot vs the Crock Pot, I looked for similar soups and chilis online to see how they were cooked. That gave me a great starting point for converting my recipe! Use this post and free printable to determine how long to cook meats in the Instant Pot. I’ve found that some people like to add or decrease time based on their preferences, but this is a great place to begin. 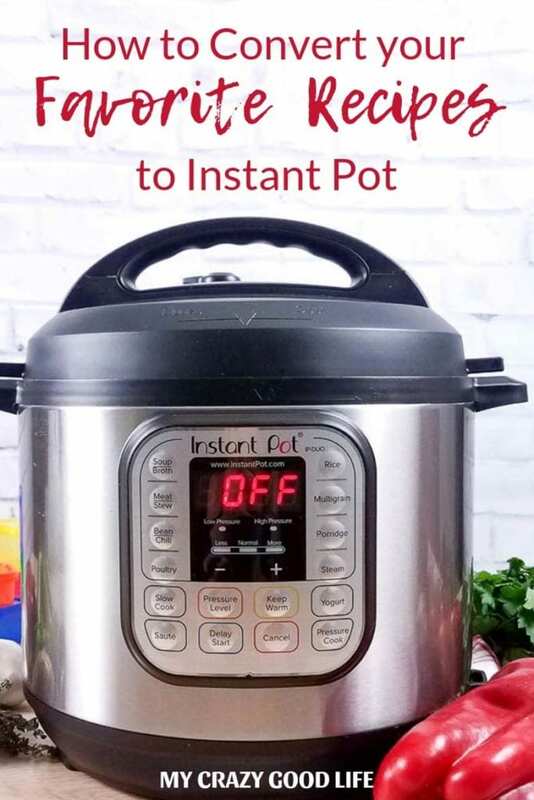 Use this post and free printable to determine how long to cook and steam your vegetables in the Instant Pot! Vegetables are pretty delicate and there are a few great guidelines here for making sure they always come out perfect. The hardest part to figure out when trying to convert recipes to Instant Pot standards is the cook time. This Instant Pot Cooking Times for meat, this one for vegetables, and these cook time charts are lifesavers if you don’t have a similar recipe that you can use for that information. They’ll help you determine the base cooking time that is necessary for your ingredients–save them to your phone or tablet! If you don’t want to cook in stages, make sure the ingredients you are using have similar cook times. Determine your cook times using the charts linked above and then make sure you alter the ingredients so that they have similar cook times. If that means pre-cooking a few of the items or cutting up meat so it is in smaller chunks you may have to do some trial and error in this process the first few times around! Another big part of Instant Pot cooking that is not so important in other recipes is the amount of liquid you need to use. A good general rule of thumb when trying to convert recipes to Instant Pot cooking is to use at least 1 cup of water for your 6 qt pot, 1 1/2 for your 8 qt. I’ve written an article about the differences between Instant Pot models and how to make sure your recipes always turn out, no matter what model you have. There will be very little water lost when cooking with a pressure cooker so adjust this accordingly if you have a lot of wet vegetables or chicken in your recipe. Items that have a high water content already won’t need the full amount of water or liquid to cook properly in the Instant Pot. If you are not sure which pressure release to use just do the quick release method, where you open the valve immediately after the cook time is complete. While meat can usually benefit from a natural pressure release (where the pot finishes cooking and the pressure naturally releases without you moving the valve), things like rice, pasta, and delicate vegetables can overcook quickly at the end and do better with the quick pressure release. The best way to figure out how to convert recipes to Instant Pot cooking methods is by trial and error. You might get a couple flops but the best way to learn is to try and then keep track of what works and what does not. Jot down times and temperatures next to your recipes so you know what to use the next time around! There is a whole system for converting cooking times for higher altitudes. It’s really easy and I’ve made a great cheat sheet for those of you who need this info. It’s right here! Looking for some delicious Instant Pot recipes to try? Nice tips! Thanks! I’m learning how to cook in mine with a lot of trial and error but I love it so far. When I didn’t have access to a stove or oven it saved my if! I still wonder about how full we can fill the IP. I’ve read about 2/3 full in other places too but confused as to why the internal Pot itself seems to have a different Max line. Becca, do you have this anywhere that I can get a copy? I don’t want to copy and print it out. The 2/3 rule is for foods that can become foamy when cooking, such as bean soup.